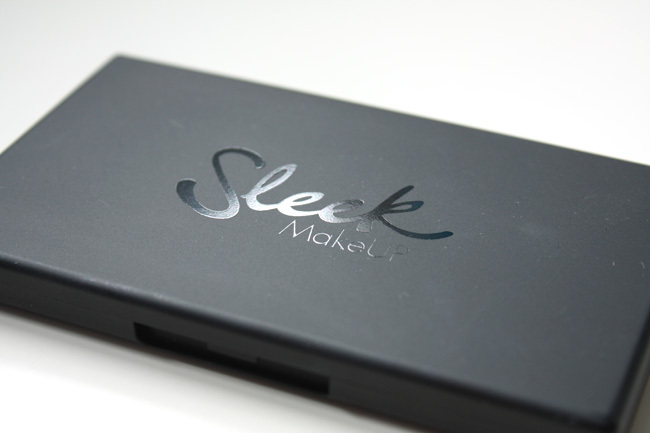 I don't actually own many products from the sleek range; a make up staple for me is their original contour kit which I use all the time. 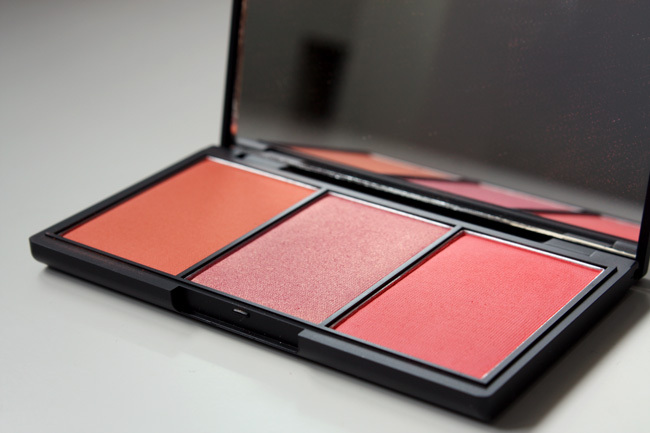 So when I saw the colours in the Sleek blush by 3 - Lace palette I had to have it! 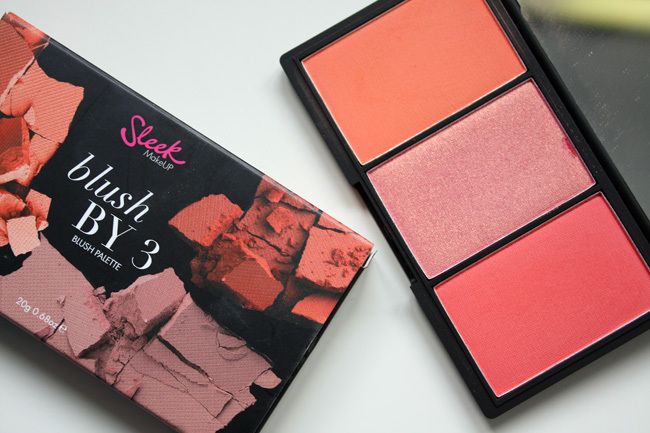 Sleek do quite a few colour variations in the blush by 3 palettes including some new cream blushers and for just under £10 you get 3 decent size blushes! Bargain! 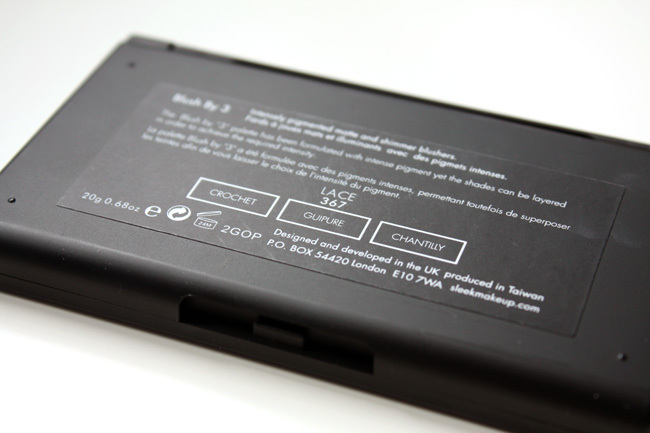 The lace palette comes in the well known black sleek packaging, which annoyingly gets grubby really fast and shows up smudges and fingerprints. You can always wipe it clean so I can't complain too much. On the inside the lid turns into a large mirror, great for on the go application (not sure how much travelling the palette can with stand though, as I already have a tiny bit of damage to Guipure -may be from nails though). The lace palette consist of three shades; two matt and one shimmer. 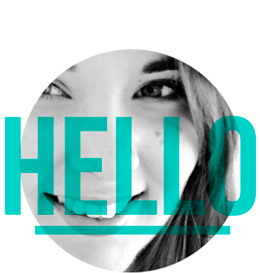 They're all coral/peach based and are prefect for spring/summer. As you can see these blushes are SUPER pigmented! Like if you're not carefully you will have a very dramatic bold look that very few people can ever pull off! (maybe just clowns :p!) Anyways, these blushes are very wearable and blend easily as long as you apply gradually and tap off excess from the brush before applying. They're all really soft and smooth, even the shimmery one - no chunky glitter. For each swatch I've done a full swatch and also a very light dusting of each blush, just to show that they don't always look harsh and bright. All swatches were photographed in natural daylight. Crochet is a terracotta orange coloured blush, which when used sparingly can add a subtle hint of colour to add some warmth to the face. I think out of the three blushes this is my least favourite only because I think it will look best with a tan - something that I don't always have. 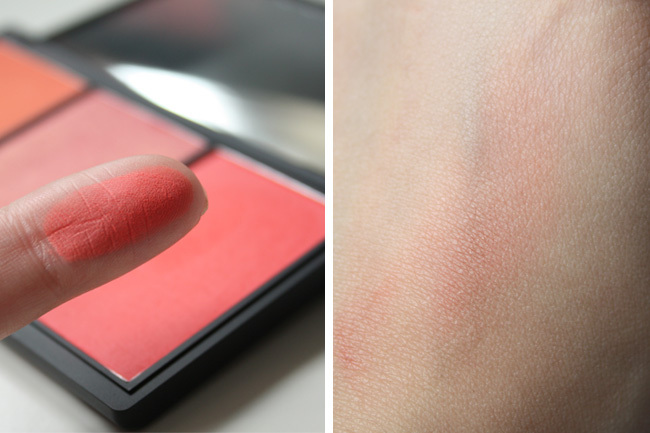 I love this blush, it's the only shimmer colour in the palette and my gosh it's gorgeous. 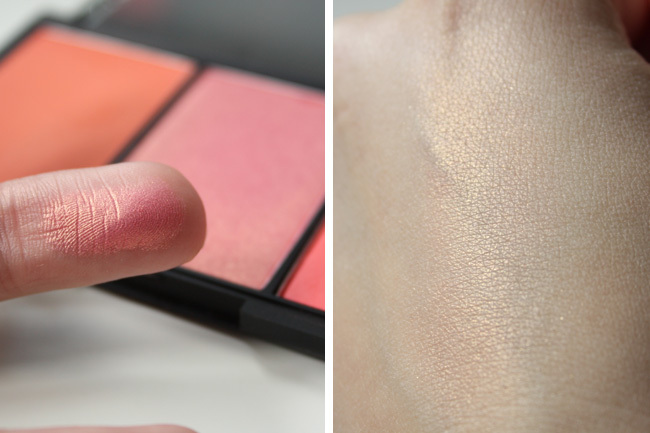 Guipure is peachy/pink toned blush with gold shimmer running through it. 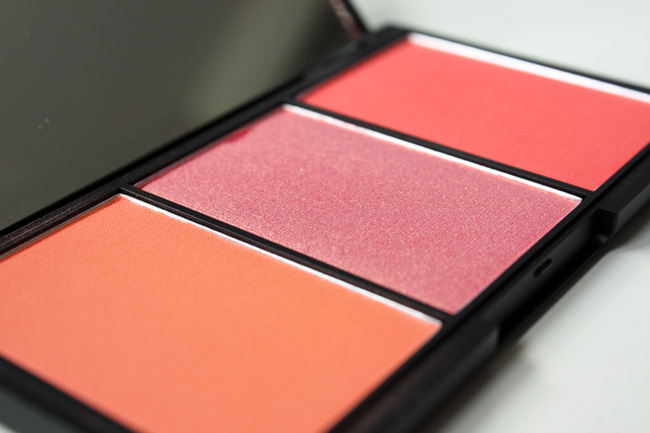 It's perfect for layering over the top of other blushes to add a warm shimmer or as a highlight over the top of your cheek bones for a gorgeous glow. It's very buildable - as you can see from the swatches - a light dusting shows the gold more but a heavier application lets the pink shine through. B-e-a-utiful. 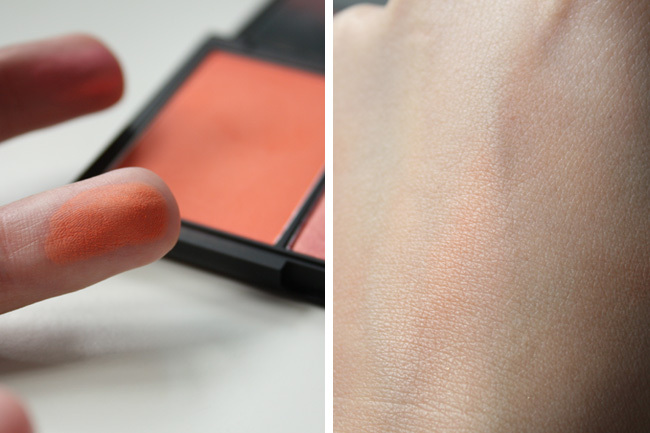 Chantilly is a coral orange shade that if used lightly adds a lovely natural flushed colour to the cheeks. A perfect shade to compliment your skin tone in the warmer months. Overall I love this palette and how compact it is. The blushes are soft and really pigmented, the only problem is now I want more of them!! You can get this palette for £9.99 from sleek, superdrug and now boots too. 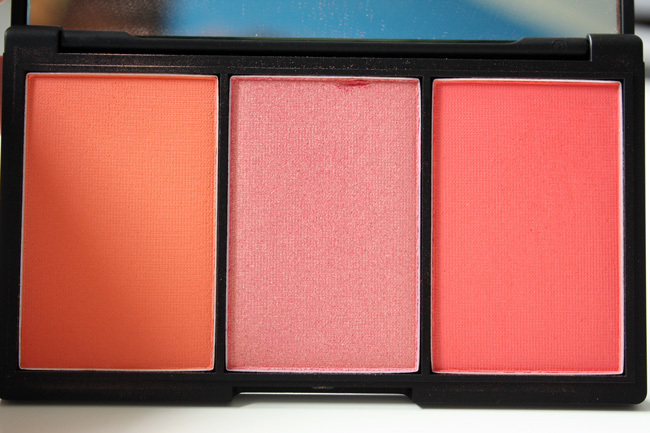 Have you tried this palette or any of the other blush by 3's? I'd love to know your favourite ones! It such a pretty palette! Think I need to buy more hehe!